Location: Situated in Llanwnnen village on W side of B 4337 some 60m N of the cross-roads with A475. Medieval church restored 1875-7 for £880 by R. J. Withers. W tower probably C15 is added to an earlier nave, as seen by the battered base of inside W wall. Nave and chancel rebuilt within the old walls in 1875-7. In 1810 the church had a medieval carved wood screen and octagonal font. 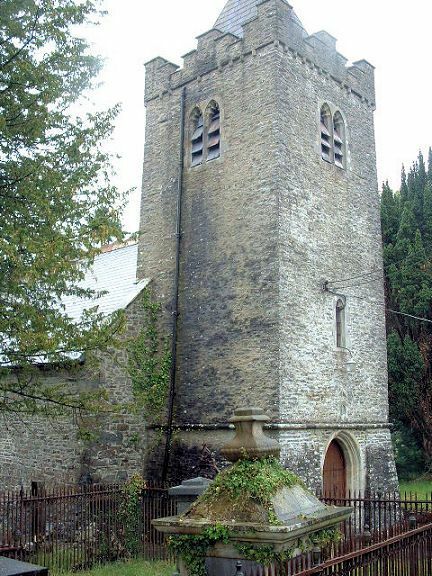 In 1848-52 some repairs were done probably by C. Davies of Cenarth. Rubble stone with ashlar dressings. Slate roofs with coped gables, two cross finials and red terracotta crested ridge tiles. W tower, nave, chancel and lean-to N vestry. Tower has high battered base with bull-nosed string course over moulded pointed W door. 1877 door with ornate hinges. Above the string course is small late medieval carving, a rough roundel with swaddled figure (similar to carved panel in Llanwenog church) and above is late medieval ogee-headed fragment of a traceried panel with centre mullion. Single cusped lancet (renewed) above, and renewed 2-light cusped bell opening. Corbelled parapet and stepped battlements (renewed), and recessed slate pyramid spire. Similar bell-lights on other sides. Nave and chancel are substantially rebuilt, but stone work of lower parts of walls is probably original. Simple flat-headed windows with cusped pointed lights, of 1877. Nave S 3-light and 2-light. A blocked arched doorway between. Nave N 2-light, chancel S 2-light. N vestry with W door, small N single light and E single-light. Chancel E window 3-light segmental-pointed, is in a white stone and may date from c1930 when stained glass was inserted. Below is datestone of 1877. Nave SW corner stone has small medieval square relief panel of Crucifixion with two attendant figures. Tower is not vaulted within. Simple plastered interior of 1877, with cambered relieving arches, open wagon roofs of arch-braced collar trusses and similar rafters with moulded longitudinal ribs. 1877 octagonal font, painted ashlar with quatrefoil panels., moulded shaft with angle beads and moulded base. Pine pews with blank quatrefoil roundels in bench-ends. Rough stone stoup reset in W wall. Plain pine pulpit. Chancel with painted ashlar three-bay reredos, wide cinquefoil-cusped panels with gold mosaic inserts, a cross in centre and floral vases each side. Cusped-pointed piscina with shelf on S wall. E window 3-light stained glass, c1930, of Resurrection, Crucifixion and Ascension. Listed principally for the good medieval tower, with two rare medieval carvings.